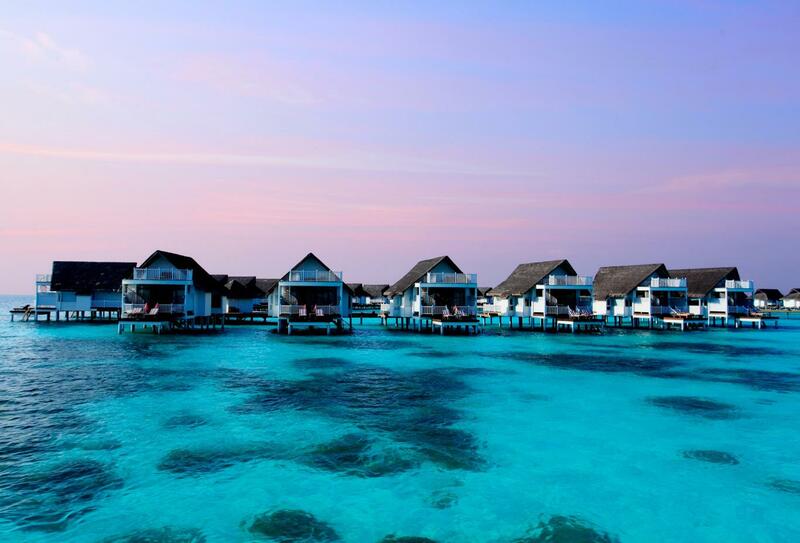 Located on the stunning South Ari Atoll 25 minutes by Seaplane from Malé, Centara Grand Island Resort & Spa is a true 5-star resort surrounded by crystal clear waters. This resort welcomes families and has a wide range of activities for both families and couples in a dazzling setting – making a stay at Centara Grand one you will remember for the rest of your life. 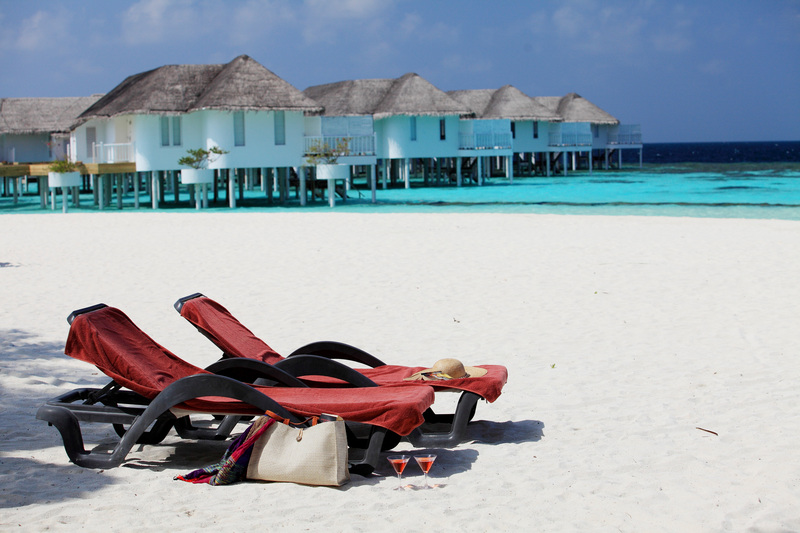 The luxurious restaurants and rooms with breathtaking views bring a sense of serenity to your Maldives holiday. 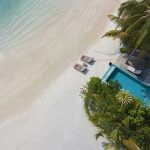 This resort makes for the ultimate All-Inclusive experience in a tropical paradise, meaning you can leave all your cash behind and simply enjoy yourself to the full… Champagne breakfasts and free-flowing beverages add to the amazing overall experience. 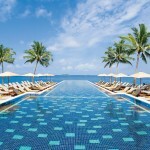 Indulge in barefoot luxury and gorgeous swimming pools at Centara Grand Island Resort and Spa. It’s a decision you won’t regret. 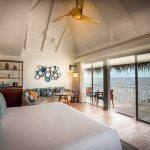 The Beach Suite (87 sqm), located on the west side of the island, is split over two levels, with a separate living area and sleeping quarters on a mezzanine floor. There is plenty of space for either three adults or two adults and two children. The island bathtub is simply breathtaking… relaxing here while watching the sun go down makes for memories of a lifetime. 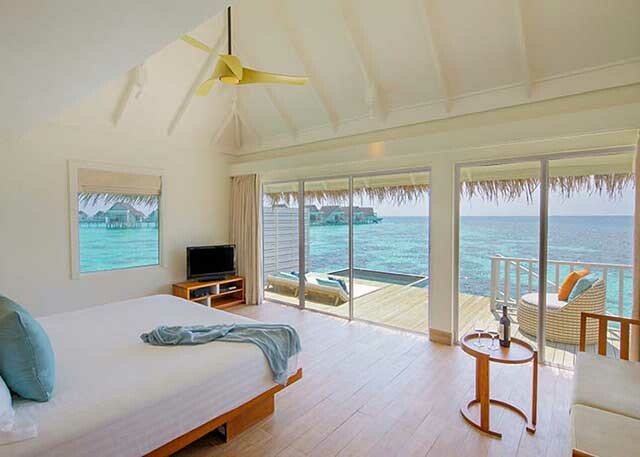 The Deluxe Water Villa (87 sqm) is a very popular choice for couples, but three people would be more than catered for as well. 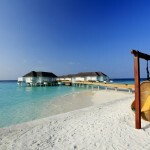 This stylish villa is located directly above the stunning lagoon and has a romantic feel to it. 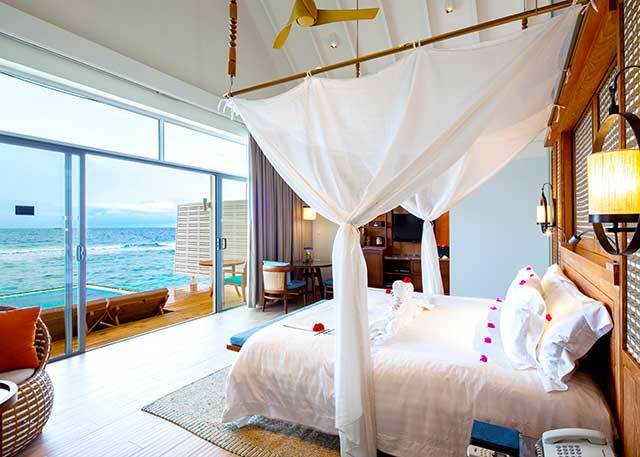 The personal Jacuzzi tub is the main feature, along with the breathtaking views of the Indian Ocean. 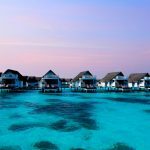 These gorgeous newly refurbished Ocean Water Villas (110 sqm) sit perched above the gentle waters of the western side of the island. Designed for easy style lagoon life each villa has a generous space and an emphasis on outdoor enjoyment. 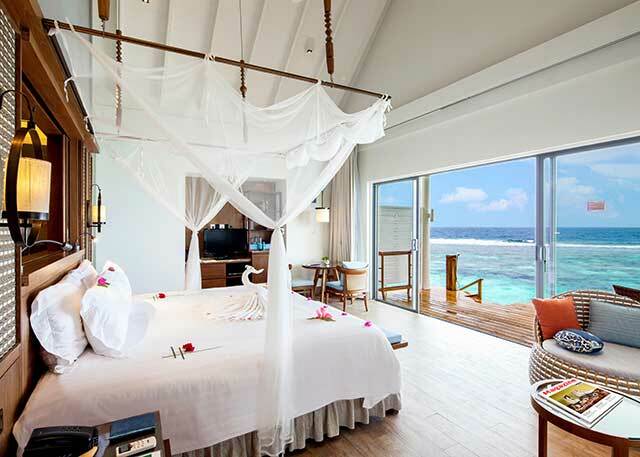 The villas feature a private terrace for lounging, an indulgent bedroom with perfect sea views, and steps that lead directly to the warm clear water of the sparkling lagoon. 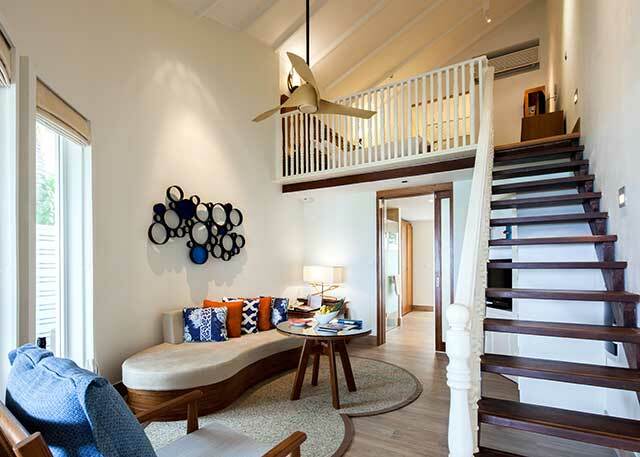 These villas can accommodate three adults or two adults and one child. 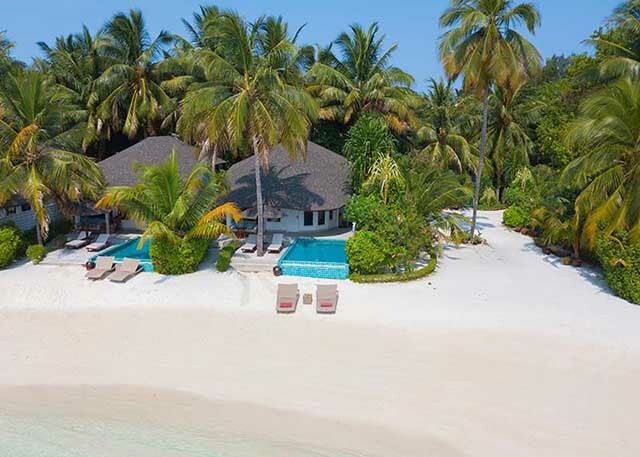 With white sand fringed by crystal clear waters just steps outside your Luxury Beachfront Pool Villa (159 sqm), you can indulge in barefoot luxury and enjoy abundant living space in this slice of paradise. These villas feature a generous private plunge pool and private terrace to make the most to the perfect Maldivian surroundings. They are designed for two adults with an indulgent bathroom and airy romantic interiors. With fresh interiors that blend harmoniously with the natural environment and their own beachfront, these expansive (159 sqm) pool villas are ideal for families with up to three children. 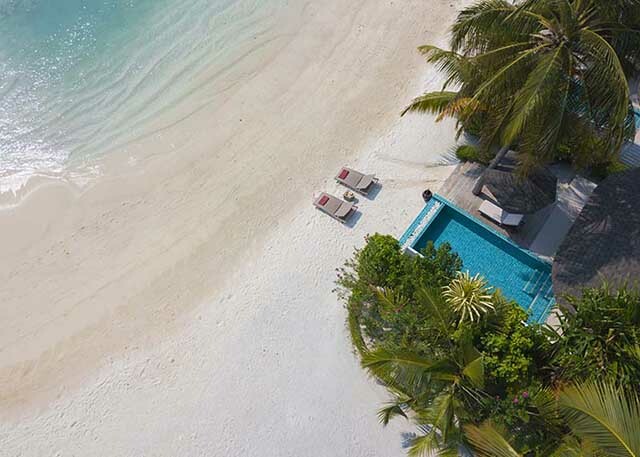 Each Luxury Beachfront Pool Villa Two-Bedroom is an indulgent tranquil retreat, located just steps away from the shimmering lagoon and features private plunge pool on the terrace. 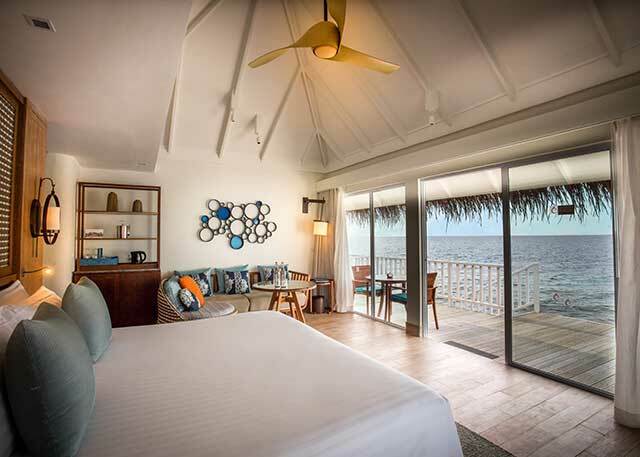 The Luxury Sunset Water Villa (110 sqm) is a popular choice for families who want a spacious accommodation with the finest views over the lagoon just west off the shore. The villa’s location is superb with direct access to some of the best snorkelling on the island and ocean access. 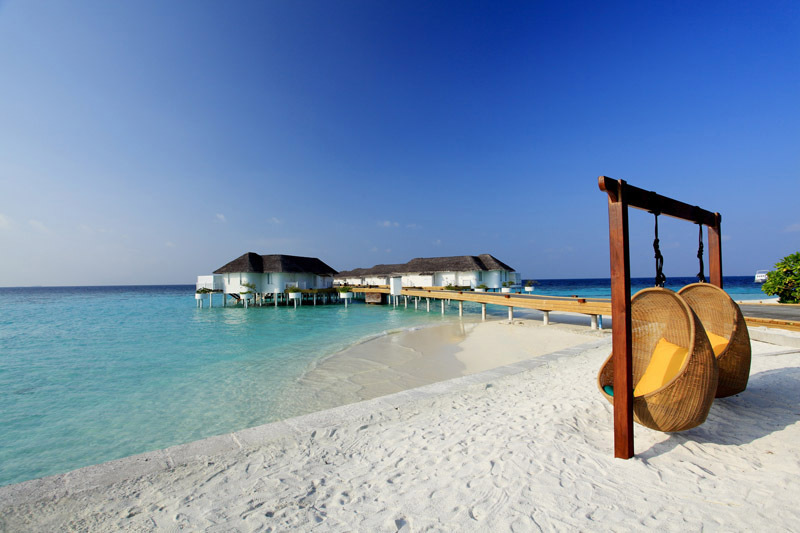 Set on the western side of the island these villas enjoy a superior view of the colourful Maldivian sunset. With plenty of space to spare these indulgent airy villas are ideal for families and can accommodate three adults or two adults and one child. Both adults and children will be fully satisfied at Centara Grand Island Resort, with free-flowing beverages and food aplenty there’s never anyone going wanting. 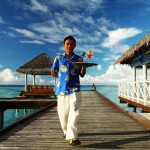 There is nightly entertainment as well as day time activities on offer. 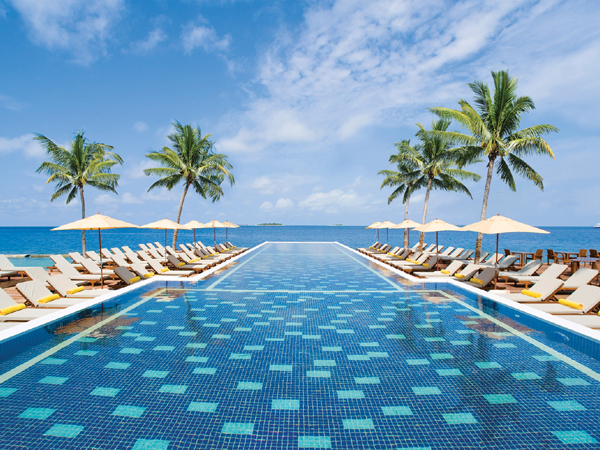 Joining the Kids Club, splashing around in amazing swimming pools, kayaking, working out in the fitness centre, windsurfing, diving or catamaran island hopping are just a few things that will keep you busy and help you to make the best out of your holiday in the tropical paradise of Centara Grand Island Resort. All the family will enjoy its exclusive facilities. 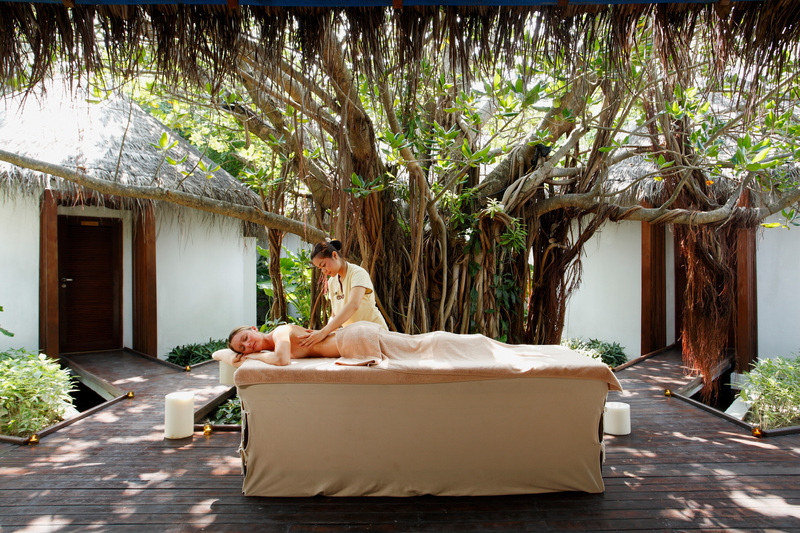 SPA Cenvaree provides the ultimate escape from your everyday stresses… Here your wellbeing needs will be taken care of through the most exclusive beauty treatments and massages inspired by traditional Thai healing methods. 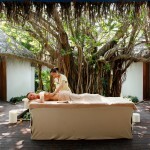 The spa features a Vichy rain shower and a tranquil outdoor relaxation lounge. 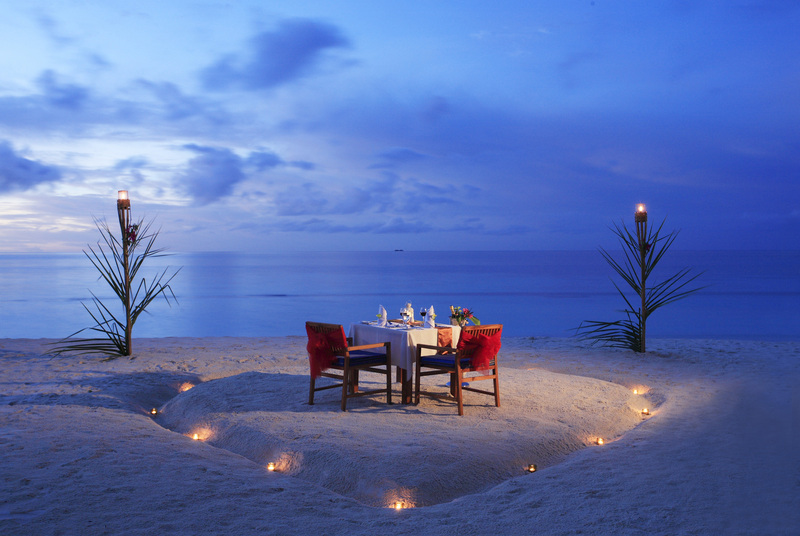 Six wonderful restaurants are available for you on your Maldives holiday at Centara Grand Island Resort. Of course you can always opt to dine in your private villa, enjoying the stunning setting together with your family or loved one. 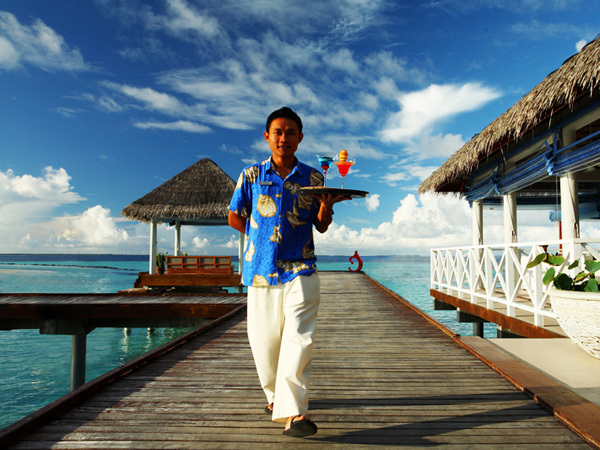 Reef, with its expansive breakfast and lunch buffets, serves both Asian and Western food. This restaurants seats 194 and is the perfect choice for a family meal as it’s located by the main pool. Lotus provides a more intimate setting overlooking the lotus pond in the centre of the island. 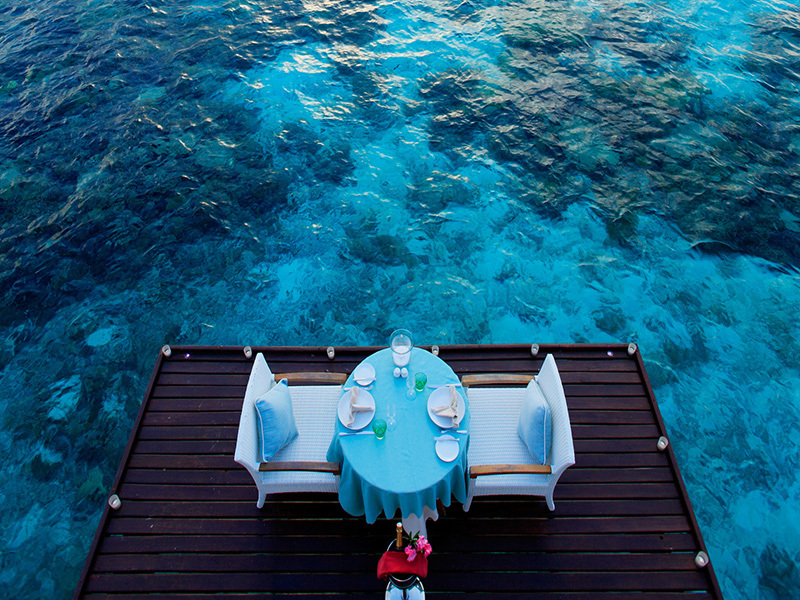 This exclusive restaurant seats 48 guests and here you will be able to enjoy some of the very best Thai food in the Maldives. Azzuri Mare Seafood Restaurant is where you will head for the freshest seafood or a delicious Australian steak. 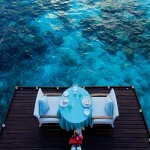 Booking is essential if you want to dine here with the sunset above the stunning lagoon as backdrop. Coral is a popular restaurant and bar for families, located by the main pool on the east side of the island. It seats 110 people and has fantastic entertainment, funky music and exotic drinks on offer. 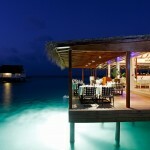 Aqua is a gorgeous bar located directly over the lagoon close to the Luxury Sunset Water Villas. 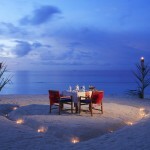 This is the place to go to enjoy a refreshing drink in a romantic, peaceful setting. Aqua seats 63 guests. 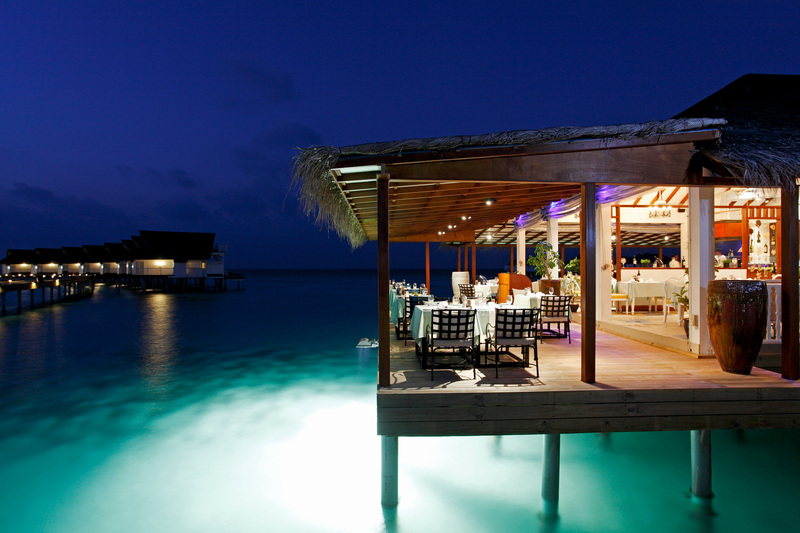 Island Club is an exclusive restaurant only for Club guests. Hearty continental breakfasts, snacks, afternoon tea and cocktail hours are available. Island Club seats only 30 guests, giving an even more special feel to it. 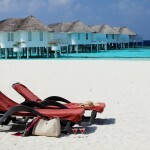 Simply Maldives Holidays offer the Ultimate All-Inclusive package for guests staying at Centara Grand Island Resort.